What does this mean? Essentially, it is not enough that you were invited onto the site for the benefit of the business and encountered a dangerous condition that resulted in an injury. What you are also responsible to prove is that the store either had “actual knowledge” (the business/ its agents created the dangerous condition or was specifically informed about it) or “constructive knowledge.” Constructive knowledge is a bit trickier. It means the business knew or should have known about the condition because either it existed for a certain period of time during which the business – in the course of using ordinary care – should have discovered it OR it was a condition that occurred with regularity so the business should have foreseen it. Because actual knowledge is rare and sometimes difficult to prove, most South Florida slip-and-fall injury cases assert constructive knowledge. This too can be challenging to prove, so it’s important that you and your slip-and-fall injury attorney in West Palm Beach – or wherever you’re located – carefully review each element so you know whether your claim is viable. We say all this not to discourage anyone. Of course, if you’re injured, that initial consultation with an attorney is free and worth your while, especially if you’ve suffered serious injuries. Rather, we mention it so all potential clients are fully aware of what they are up against. The attorney with whom you meet should be able to give you a good sense at that initial consult whether the facts of your case align with the law to pave the way for a winnable case. 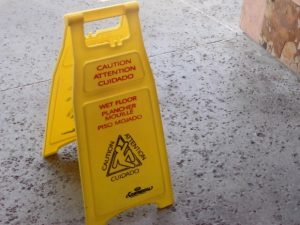 A recent Miami slip-and-fall lawsuit had a disappointing outcome for plaintiff – and again, it came down to that constructive knowledge element. According to records with Florida’s Third District Court of Appeals, plaintiff accompanied her neighbor to a Costco store and slipped and fell in something wet outside near the entrance. It wasn’t raining at the time. Plaintiff hadn’t noticed anything wet before she fell (and never actually identified the substance except to say it was “wet”). No employees were nearby when she fell and she produced no evidence that anyone else fell at that location at any point previous to her own fall. Plaintiff suffered a broken knee cap, and later sued the store for negligence. Defendant store moved for summary judgment, arguing a lack of genuine material fact about whether it had constructive knowledge of the alleged hazard. Trial court agreed and granted the request. The 3rd DCA affirmed. There was no evidence of actual notice, and no indication was given that the store should have known about the substance prior to her fall.